Cell and Molecular Biology Division, Department of Botany, University of Calicut, Malappuram - 673635, Kerala, India. ABSTRACT: Gomphostemma Wall. ex Benth. belongs to the family Lamiaceae. The present study evaluated selected species of Gomphostemma endemic to the Western Ghats for their anti-inflammatory property. Traditionally, many species of Gomphostemma are used to treat malarial fever and inflammations caused by insect stings. Methanol extracts of Gomphostemma heyneanum var. heyneanum, G. heyneanum var. rottleri and G. eriocarpum were prepared and subjected to various in-vitro assays to examine their anti-inflammatory potential. Anti-inflammatory activity was initially screened with protein denaturation and proteinase inhibitory assays. Among the three extracts screened, G. heyneanum var. heyneanum showed significant activity comparable to the standard diclofenac sodium. Further, the effective extract of G. heyneanum var. heyneanum was evaluated for its effect on LPS induced RAW 264.7 cells. The effect of the extract on various inflammatory mediators like cyclooxygenase (COX), cellular nitrite and inducible nitric oxide synthase (iNOS) were analyzed. The extract inhibited cyclooxygenase and inducible nitric oxide synthase activity in a dose-dependent manner projecting the anti-inflammatory potential of the plant. The potent phytochemicals present in the plants may be attributed to the activity shown by the plants. INTRODUCTION: Inflammation is the body’s shielding response towards pernicious stimuli like infections or tissue damages which in turn triggers a complex cascade of events initiating the healing process. Usually, acute inflammatory responses are temporary and may contribute to mitigating the injury or infection leading to tissue restoration. But uncontrolled inflammatory responses may at times become harmful leading to chronic inflammatory diseases 1. Uncontrolled inflammatory responses are associated with a vast range of conditions like allergies, cardiovascular dysfunction, cancer, arthritis, metabolic syndromes, and many autoimmune diseases. Various medicines used for controlling and suppressing inflammations like steroidal, non-steroidal and immune suppressant drugs are associated with adverse side effects primarily leading to gastrointestinal complications 2. Thus, there is a need for a natural drug or compound derived from sources like plants with effective anti-inflammatory property but with minimum side effects. Macrophages are a part of the mononuclear phagocyte system. They play a vital role in different stages of inflammation by producing a wide range of biologically active molecules which can bring about both beneficial and detrimental outcomes in inflammation. When stimulated, macrophages release numerous cytokines and inflammatory mediators so that therapeutic interventions targeting macrophages as well as their products may help control inflammatory diseases. Therefore, macrophage cell lines are excellent models for screening anti-inflammatory drugs 3. Lamiaceae is a plant family with about 7,000 plant species and enjoys a cosmopolitan distribution. Plants belonging to this family include Ocimum, Mentha, Leucas, Pogostemon, Thymus, etc., many of them are with medicinal properties and therapeutic value. Hence, they are used in the preparation of many herbal drugs for alleviating various ailments. Gomphostemma represents an under-exploited genus in this family. Some species of Gomphostemma are used in treating diarrhea and dysentery by the tribes of Wayanad, Kerala, India 4. They are also reported to possess antioxidant properties 6. In the light of above background, the present study was aimed to screen the anti-inflammatory potential of selected species of Gomphostemma endemic to the Western Ghats by evaluating the effect of methanolic extracts of G. heyneanum var. heyneanum, G. heyneanum var. rottleri and G. eriocarpum on inflammatory mediators in LPS stimulated RAW 264.7 cells. Collection of Plant Material: Aerial parts of selected species of Gomphostemma were collected from Nelliyampathy forest area of Palakkad district and Ranni forest area of Pathanamthitta district, Kerala, India. Plants were identified, and herbarium specimens for each plant species (CALI 123772 for G. heyneanum var. heyneanum, CALI 123773 for G. heyneanum var. rottleri, CALI 123774 for G. eriocarpum) were deposited in Calicut University Herbarium. Plant materials were shade dried, powdered and stored in airtight containers for further use. Preparation of Plant Extract: For in-vitro anti-inflammatory studies, 50 mg each of powdered material was extracted with methanol in a Soxhlet extractor. All the extracts were filtered and concentrated in a rotary evaporator. The crude extracts were then stored at 4ºC for further analysis. Inhibition of Protein Denaturation: The effect of plant extracts on protein denaturation was studied by the method as referred with slight modifications 7. The reaction mixture consisted of different concentrations of plant extracts (62.5 μg, 125 μg, 250 μg and 500 μg/ml) and 1% aqueous solution of bovine albumin fraction. The pH of the solution was adjusted to 6.3 with 1 N HCl. The reaction mixtures were then incubated in 37 ºC for 20 minutes and then heated at 57 ºC for 20 min. After cooling, the turbidity was measured spectrophotometrically at 660 nm. The experiment was done in triplicates. Diclofenac sodium was used as the standard. Proteinase Inhibitory Activity: Proteinase inhibitory activity of plant extracts were evaluated as per standard method with minor modifications 8. 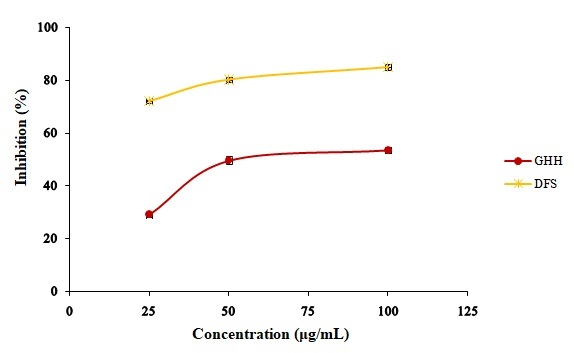 The reaction mixture (2 ml), containing 0.06 mg trypsin, 1 ml 20 mM Tris-HCl buffer (pH 7.4) and 1 ml test sample of different concentrations (62.5- 500 μg/ml) was incubated at 37 ºC for 5 min. Then 1 ml of 0.8% (w/v) casein was added. The mixture was incubated for an additional 20 min, and 2 ml of 70% perchloric acid was added to terminate the reaction. Cloudy suspension was centrifuged at 3000 rpm for 10 min. The absorbance of the supernatant was read against buffer as blank at 210 nm. Diclofenac sodium was the standard. The experiment was performed in triplicates and the percentage of inhibition was calculated. Anti-Inflammatory Assays with RAW 264.7 Cells using G. heyneanum var. 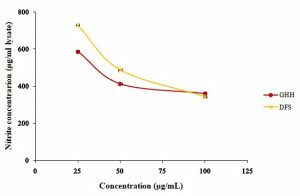 heyneanum Extract: Lipopolysaccharide (LPS) stimulated RAW 264.7 rat macrophage cell lines were exposed to different concentrations (25, 50 and 100 µg/ml) of plant extract of Gomphostemma heyneanum var. heyneanum and kept for 24 h incubation. After incubation, cell lysate was used for further studies. Diclofenac sodium was used as the standard. Determination of Cyclooxygenase (COX) Activity: The assay was performed by Walker and Gierse method 9. 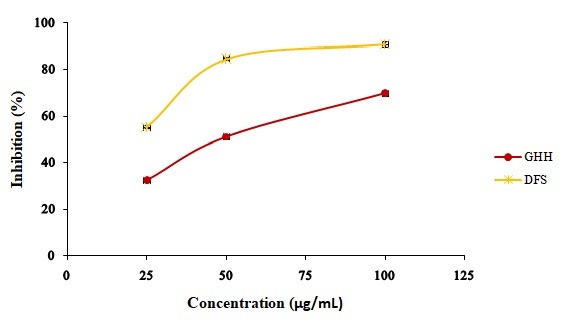 The assay mixture containing 100μl of cell lysate was incubated with Tris-HCl buffer, 5 mM glutathione, and 5 mM hemoglobin for 1 minute at 25 ºC. 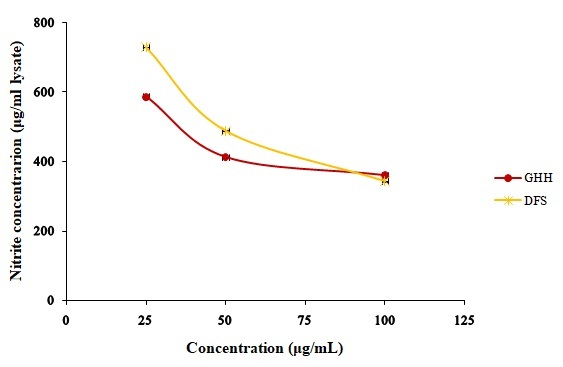 The reaction was initiated by adding arachidonic acid (200 mM) and ended after 20 minutes incubation by adding 0.2 ml of 10% trichloroacetic acid in HCl and 0.2 ml of thiobarbituric acid. The contents were placed in a boiling water bath for 20 min, cooled, and centrifuged at 1,000 rpm for 5 min. The supernatant obtained was measured at 632 nm, and the percentage of COX inhibition was determined. Determination of Cellular Nitrite Levels: The level of cellular nitrite was determined by standard protocol 10. The reaction mixture containing 0.5 ml of cell lysate and 0.1 ml of sulphosalicylic acid was vortexed well for 30 min. The samples were centrifuged for 15 min at 5,000 rpm. Estimation of nitrite levels was made with the supernatant. To 200 μl of supernatant 30 μl of 10% NaOH and 300 μl of Tris-HCl buffer was added and mixed well. Griess reagent (530 μl) was added to this and incubated in the dark for 15 min. Absorbance was read at 540 nm against Griess reagent as blank. Diclofenac sodium was the standard. The amount of nitrite present in the samples was estimated from the standard curves. Determination of Inducible Nitric Oxide Synthase (iNOS): Cell lysate was homogenized with 2 ml of HEPES buffer. To 0.1 ml of this, 0.1 ml L-arginine, 0.1 ml manganese chloride, 0.1 ml dithiothreitol, 0.1 ml NADPH, 0.1 ml tetra-hydropterin and 0.1 ml oxygenated haemoglobin was added. Absorbance was measured at 401 nm to determine the iNOS activity 12. Statistical Analysis: All experiments were done in triplicates and statistical analysis was done with SPSS version 10. Data obtained were subjected to one-way ANOVA and results were expressed as mean ± SE. Differences at p<0.05 were considered significant. RESULTS AND DISCUSSION: Present study analyzed the anti-inflammatory potential of selected species of Gomphostemma by measuring the effect of plant extracts on various inflammatory mediators. 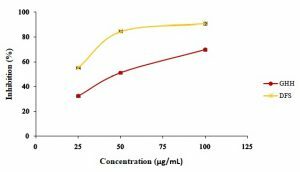 The effect of extracts on inhibiting protein denaturation and proteinase activity was used for initial screening. The effective plant extract was further analyzed for its activity on inflammatory mediators like cyclooxygenase, cellular nitrite level, and iNOS. Inhibition of Protein Denaturation: Protein denaturation is a well-documented cause of tissue damage associated with inflammation. Compounds that can prevent protein denaturation are highly recommended as anti-inflammatory agents 12. This assay is considered as an alternative for animal models especially for initial screening of anti-inflammatory drugs 13. The present study evaluated the effect of methanolic extracts of selected species of Gomphostemma in inhibiting heat-induced protein denaturation. All the extracts inhibited protein denaturation in a dose-dependent manner. At highest concentration (500 μg/ml) G. heyneanum var. heyneanum produced 80.99% of inhibition while G. heyneanum var. rottleri and G. eriocarpum showed 75.1% and 49.79% of inhibitions respectively Fig. 1. Thus, extract of G. heyneanum var. heyneanum was found to be effective in inhibiting protein denaturation as compared to the other two extracts. FIG. 1: EFFECT OF SELECTED TAXA OF GOMPHOSTEMMA ON PROTEIN DENATURATION. GHH- G. heyneanum var. heyneanum, GHR- G. heyneanum var. rottleri, GE - G. eriocarpum, DFS- Diclofenac sodium. Data expressed as Mean ± SE of three replicates. Proteinase Inhibitory Activity: Proteinases have a functional role in the appearance and development of inflammatory diseases. Studies have shown that proteinase inhibitors can minimize the tissue damages associated with inflammation 14, 15. The tested plant extracts significantly inhibited proteinase activity and in this assay also G. heyneanum var. heyneanum showed a better performance as compared to the other two extracts with an inhibition percentage of 81.15% at the highest concentration. At the same concentration G. heyneanum var. 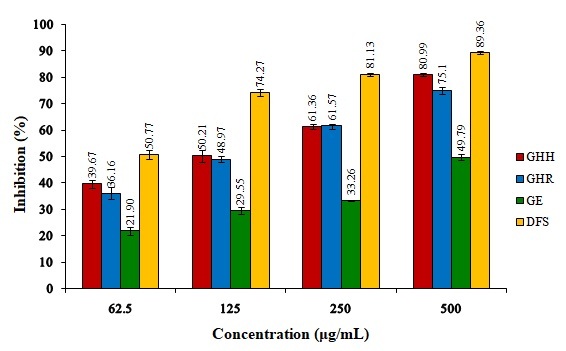 rottleri and G. eriocarpum exhibited 68.95% and 56.56% of inhibition respectively Fig. 2. Since in both the assays, extract of G. heyneanum var. heyneanum displayed a better activity as compared to the other two taxa, it was further analyzed for its effect on RAW 264.7 cell lines. FIG. 2: EFFECT OF SELECTED SPECIES OF GOMPHOSTEMMA ON PROTEINASE INHIBITION. GHH- G. heyneanum var. heyneanum, GHR- G. heyneanum var. rottleri, GE - G. eriocarpum, DFS-Diclofenac sodium. Data expressed as Mean ± SE of three replicates. Determination of Cyclooxygenase (COX) Activity: Cyclooxygenase (COX) enzymes are involved in the synthesis of prostaglandins in arachidonic acid metabolism, and these prostaglandins are important mediators of inflammation. Among the two isoforms of COX, COX-2 is the inducible form highly expressed in inflamed tissues. Anti-inflammatory and therapeutic potential of many nonsteroidal anti-inflammatory drugs is attributed to their inhibitory effect on cyclooxygenase enzymes 16. Treatment with extract of G. heyneanum var. heyneanum significantly reduced COX activity in a dose-dependent manner Fig. 3. This assay, therefore, clearly demonstrated the anti-inflammatory efficacy of the plant extract. FIG. 3: EFFECT OF G. HEYNEANUM VAR. HEYNEANUM ON CYCLOOXYGENASE ENZYME ACTIVITY. GHH- G. heyneanum var. heyneanum, DFS-Diclofenac sodium. Data expressed as Mean ± SE of three replicates. Determination of Cellular Nitrite Levels: Cellular nitrite level (NO) is a diagnostic marker of inflammation. The overproduction of NO as an inflammatory mediator can lead to tissue destruction, and therefore NO inhibitors are therapeutic targets in the management of inflammatory diseases 17. 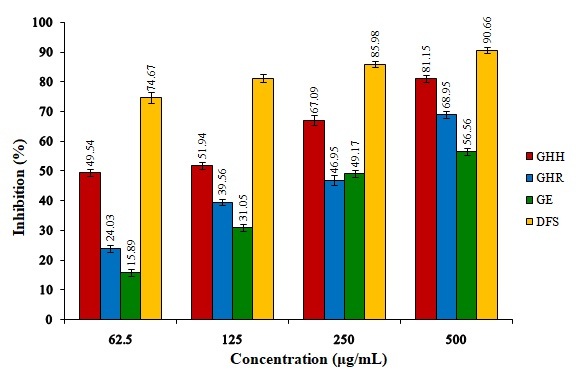 Treatment with different concentrations of plant extract induced a notable reduction in nitrite levels in a range similar to that of standard diclofenac Fig. 4. Reduction in nitrite level induced by the extract of G. heyneanum var. heyneanum reflects the anti-inflammatory potential of plant extract. FIG. 4: EFFECT OF G. HEYNEANUM VAR. HEYNEANUM ON CELLULAR NITRITE LEVEL. GHH- G. heyneanum var. heyneanum, DFS-Diclofenac sodium. Data expressed as Mean ± SE of three replicates. Determination of Inducible Nitric Oxide Synthase (iNOS): The nitric oxide synthase enzyme occurs in three isomeric forms of which, iNOS plays a vital role in inflammation. The inducible nitric oxide synthase (iNOS) is an important mediator in the inflammatory process and is involved in the production of nitric oxide in cells. Inducible nitric oxide synthase is a dimeric enzyme expressed in a variety of cells including macrophages. This enzyme in the presence of molecular oxygen and other co-factors converts amino acid arginine to citrulline and further to NO. Expression of iNOS generates high levels of NO for a prolonged time which in turn performs many immunoregulatory functions under a variety of pathophysiological conditions 18. But as cited previously, the excess amount of NO is injurious to cells. In the present analysis extract of G. heyneanum var. heyneanum induced a reduction in iNOS activity proportionate to increase in concentration Fig. 5. The reduction in cellular nitrite levels observed in the previous assay can be attributed to this reduction in iNOS activity and is thus justified. Since, regulation of iNOS can regulate the overproduction of NO, drugs which are selective iNOS inhibitors are regarded as effective anti-inflammatory agents. Studies have shown that many nonsteroidal anti-inflammatory drugs which are characterized as COX inhibitors also inhibit iNOS expression 19, 20. The present study revealed the anti-inflammatory property of G. heyneanum var. heyneanum. Studies have proved that this species of Gomphostemma is rich in various phytochemical like terpenoids, phenols, flavonoids, etc. and has significant antioxidative potential 21. Anti-inflammatory activity exhibited by G. heyneanum var. heyneanum can be attributed to the presence of these phytochemicals. Further extensive studies are recommended to identify the specific component responsible for the activity. FIG. 5: EFFECT OF METHANOLIC EXTRACT OF G. HEYNEANUM VAR. HEYNEANUM ON iNOS ACTIVITY. GHH- G. heyneanum var. heyneanum, DFS-Diclofenac sodium. Data expressed as Mean ± SE of three replicates. CONCLUSION: Plants are an inevitable source of compounds, providing therapeutic leads to the pharmaceutical industry. Present study focussed on screening the anti-inflammatory potential of selected species of Gomphostemma by evaluating the effect of methanolic plant extracts on various inflammatory mediators. Initial screening revealed the anti-inflammatory property of Gomphostemma species and further G. heyneanum var. heyneanum proved to be more effective with the potential to inhibit cyclooxygenase and inducible nitric oxide synthase activity. Present screening thus projects G. heyneanum var. heyneanum as an eligible candidate for comprehensive screening of anti-inflammatory property. ACKNOWLEDGEMENT: The first author gratefully acknowledges the University Grants Commission for the award of FIP for doing this research work. The first author is also thankful to the Kerala Forest Department for granting permission to collect specimens from the forest areas. Chen L, Deng H, Cui H, Fang J, Zuo Z, Deng J, Li Y, Wang X and Zhao L: Inflammatory responses and inflammation-associated diseases in organs. Oncotarget 2018; 9(6): 7204-7218. Abdulkhaleq LA, Assi MA, Abdullah R, Zamri-Saad M, Taufiq-Yap YH and Hezmee MN: The crucial roles of inflammatory mediators in inflammation: A review. Veterinary World 2018; 11(5): 627-635. Prasad AD, Shyma TB and Raghavendra MP: Plants used by the tribes for the treatment of digestive system disorders in Wayanad district, Kerala. Journal of Applied Pharmaceutical Science 2013; 3(8): 171-175. Dutta B: Study of secondary metabolites of Gomphostemma niveum f. in Assam, India. Journal of Medicinal Plants 2014; 2(5): 24-28. Shyma TB, Prasad AGD and Raghavendra MP: Assessment of antioxidant activity, total phenolic content of some medicinal plants used by the tribes in Wayanad, Kerala. 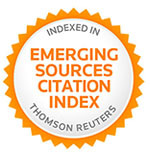 Journal of Chemical and Pharmaceutical Research 2012; 4(10, Co): 4501-4505. 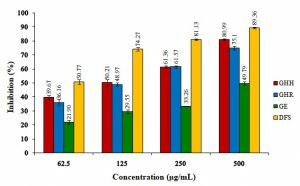 Sakat S, Juvekar AR and Gambhire MN: In-vitro antioxidant and anti-inflammatory activity of methanol extract of Oxalis corniculata International Journal of Pharmacy and Pharmaceutical Sciences 2010; 2(1): 146-55. Oyedepo OO and Femurewa AJ: Anti‐protease and membrane stabilizing activities of extracts of Fagra zanthoxiloides, Olax subscorpioides and Tetrapleura tetraptera. International Journal of Pharmacognosy 1995; 33: 65‐69. Bindu AR, Aleykutty NA and Harindran J: In-vitro anti-inflammatory screening of stem bark of Cordia oblique Willd. in RAW 264.7 cell lines. Journal of Pharmacy Research 2016; 10(6): 370-376. Lepoivre M, Chenais B, Yapo A, Lemaire G, Thelander L and Tenu JP: Alterations of ribonucleotide reductase activity following induction of the nitrite-generating pathway in adenocarcinoma The Journal of Biological Chemistry 1990; 265(24): 14143-14149. Salter M, Duffy C, Garthwaite J and Strijbos PJLM: Ex vivo measurement of brain tissue nitrite and nitrate accurately reflects nitric oxide synthase activity in-vivo. Journal of Neurochemistry 2002; 66: 1683-1690. 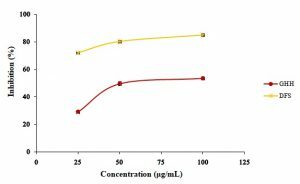 Chandra S, Chatterjee P, Dey P and Bhattacharya S: Evaluation of the in-vitro anti-inflammatory activity of coffee against the denaturation of the protein. Asian Pacific Journal of Tropical Medicine 2012; 2(1): S178-S180. Bailey-Shaw YA, Williams LA, Green CE, Rodney S and Smith AM: In-vitro evaluation of the anti-inflammatory potential of selected Jamaican plant extracts using the Bovine Serum Albumin protein denaturation Assay. International Journal of Pharmaceutical Sciences Review and Research 2017; 47(1): 145-53. Leelaprakash G and Dass SM: In-vitro anti-inflammatory activity of methanol extract of Enicostemma axillare. 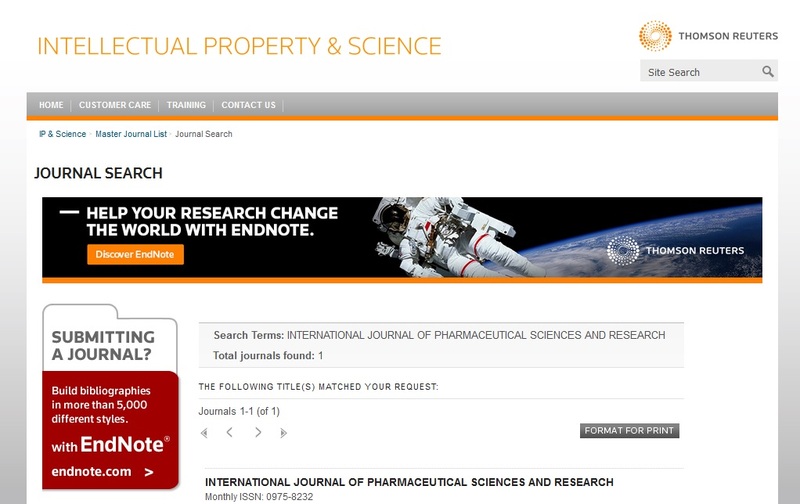 International Journal of Drug Development and Research 2011; 3(3): 189-96. Vergnolle N: Protease inhibition as new therapeutic strategy for GI diseases. Gut 2016; 65(7): 1215-24. Ziegler A, Fogle C, Blikslager A: Update on the use of cyclooxygenase-2-selective non-steroidal anti-inflammatory drugs in horses. Journal of the American Veterinary Medical Association 2017; 250(11): 1271-1274. Sharma JN, Al-Omran A and Parvathy SS: Role of nitric oxide in inflammatory diseases. Inflammopharmacology 2007; 15(6): 252-259. El-Gayar S, Thüring-Nahler H, Pfeilschifter J, Röllinghoff M and Bogdan C: Translational control of inducible nitric oxide synthase by IL-13 and arginine availability in inflammatory macrophages. Journal of Immunology 2003; 171(9): 4561- 4568. Hämäläinen M, Lilja R, Kankaanranta H and Moilanen E: Inhibition of iNOS expression and NO production by anti-inflammatory steroids: reversal by histone deacetylase inhibitors. Pulmonary Pharmacology and Therapeutics 2008; 21(2): 331-339. 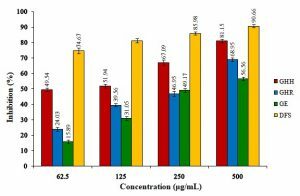 Sajitha MK and Thoppil JE: Phytochemical evaluation and in-vitro antioxidant studies of selected species of Gomphostemma ex Benth. from the Western Ghats. Journal of Drug Delivery and Therapeutics 2018; 8(6-s): 32-37. Kambrath SM and Thoppil JE: Screening selected species of Gomphostemma wall. Ex Benth. From Western Ghats for anti-inflammatory activity. Int J Pharm Sci & Res 2019; 10(4): 2012-17. doi: 10.13040/IJPSR.0975-8232.10(4).2012-17.